Do you have something pink to wear? 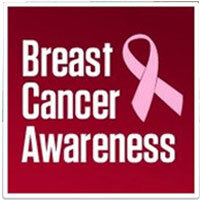 As you may know, October is Breast Cancer Awareness Month. And while you might think that in this digital age, raising awareness should be a walk in the park, you’d be neglecting to factor in the short attention span of your average internet user. So, if smart business types struggle to think up ways to raise awareness of their brands in the face of a jaded, slack-jawed populace, how are we supposed to bring attention to a vital cause? The answer: by getting very, very creative. This year, millions of impassioned supporters are contributing to an all-encompassing, multi-channel presence, with the ultimate aim being that women all over the world will encounter the campaign at some point in their daily routine in October, whether they are looking to or not. This week Lorraine Kelly dedicated a segment of her morning television show to interviewing former pop star and breast cancer survivor Bernie Nolan, and advertising instructional self-examination cards which can be ordered for free from the show’s official website. Also on ITV, popular character in the long-running soap Coronation Street (which gains up to 14 million viewers each week) is currently undergoing a diagnosis – coincidence? Surely not. But television is just the tip of the iceberg. A range of mobile apps have been developed to promote self-examination in women, and the National Breast Cancer Foundation in the US have launched a free iPhone app which offers helpful advice on risk factors, signs and symptoms, as well as practical tips on how to perform a self-examination and what to expect during a mammogram. Of course, it wouldn’t be a global phenomenon without social media behemoth Facebook playing its part; the Estee Lauder Corporation has launched a Facebook timeline app this year to mark the twentieth anniversary of its Breast Cancer Awareness campaign, entitled 20 Years of Courage, while the Breast Cancer Awareness Facebook page currently has over 3.6 million “Likes”. Both channels provide a platform on which supporters of the cause can engage with each other, and share stories about their own experiences. The Facebook page also celebrates the creative activities that are taking place all over the world to spread the word, from a Pink Umbrella Walk in Bangalore to a flash mob in the Netherlands to “I Will Survive” by Gloria Gaynor (what else?). My personal favourite so far is the video of the American football team and cheerleading squad who donned pink and made a ribbon-shaped formation during half time, but we are still only a matter of days into October. Meanwhile, over on Twitter, companies and individuals alike are showing their support in droves; at the time of writing this, a new tweet including the hashtag #BreastCancerAwareness was being posted every two minutes. To get involved, visit Facebook or Twitter. Need help with your Facebook app development or social media management campaign? Hire us today.